Saint Francis de Sales, Bishop and Doctor - My Catholic Life! It is almost an act of rudeness to limit the life of today’s saint to one page. 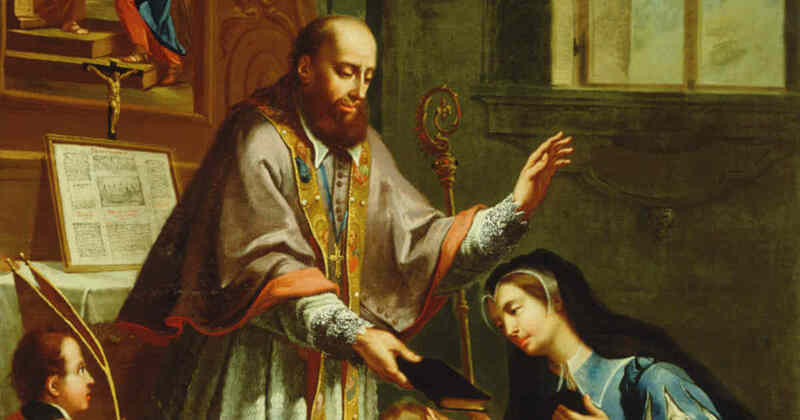 Saint Francis de Sales was a religious celebrity in his own day and age. He was an erudite, humble, tough, and zealous priest and bishop. He was holy and known to be holy by everyone, especially those closest to him. He mingled easily with princes, kings, and popes, who enjoyed his charming and educated company. He incessantly criss crossed his diocese on foot and horseback, destroying his own health, to visit the poor and humble faithful who were drawn to him as much as the high born. He embodied to the fullest that extraordinary pastoral and intellectual productivity, characteristic of the greatest saints, which makes one wonder if he ever rested a single minute, or slept a single night. 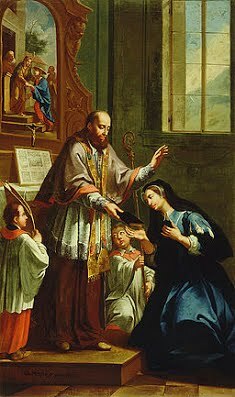 St. Francis de Sales was born and lived most of life in what is today southeast France. His father ensured that he received an excellent education from a young age, and his son excelled in every subject. His intellectual gifts, holiness, and engaging personality made him, almost inevitably, an ideal candidate for the priesthood and eventually the episcopacy. He was duly appointed the bishop of Geneva, a generation after John Calvin, a former future priest, had turned that deeply Catholic city into the Protestant Rome, leaving St. Francis as bishop of Geneva in little but name only. In carrying out his ministry, St. Francis’ weapon of choice was the pen. His apologetic and spiritual works brought back tens of thousands of former Catholics to the faith after they had dabbled in Calvinism. Saint Francis’s works were so profound, original, and creative, and his love of God so straightforward and understandable, that he would be declared a doctor of the Church in 1877. In his most well-known book, Introduction to the Devout Life, he addressed himself to “people who live in towns, within families, or at court.” His sage spiritual advice encouraged the faithful to seek perfection in the mechanics shop, the soldier’s regiment, or on the wharf. God’s will was to be found everywhere, not just in monasteries and convents. Many arduous pastoral trips through the mountains of his native region eventually wore him out. He never insisted on preferential treatment despite his status. He slept, ate, and traveled as a common man would. When he lay dying, mute after a terrible stroke, a nun asked him if he had any words of wisdom to impart. He asked for some paper and wrote three words on it: “Humility, Humility, Humility.” St. Francis is buried in a beautiful bronze sepulchre displaying his likeness in the Visitation Basilica and Convent in Annecy France. St. Francis de Sales, we ask your intercession to aid us in leading a balanced life of study, prayer, virtue, and service. You were a model bishop who never expected special privilege. Help all those who teach the faith to convey our doctrine with the same force, clarity, and depth that you did.